English Cheddar for sale. Buy online at Zingerman's Mail Order. Gourmet Gifts. Food Gifts. Universally imitated, never replicated. The original cheddar. Like the British Empire, cheddar conquered the world—it’s the planet’s most widely copied cheese. Ironically, with so much emphasis on imitation, the original has become an endangered species. It’s rarely found in this country and is worlds apart in character from its copycat cousins. 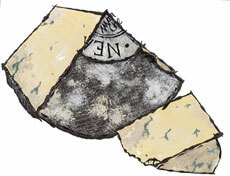 Montgomery’s is one of only three farms in its ancestral homeland making truly traditional farmhouse English cheddar. Big, clothbound drums are made by veteran cheesemaker Steve Bridges every day except Friday. All the milk comes from Jamie Montgomery's herd of just under 200 Holstein-Fresian cows, which graze on a nearby hill rumored, incidentally, to be the site of Camelot. Their cheeses have a golden color, a warm, flaky texture and a penetrating, memorable flavor. Each one is spoken for—they're taking no new customers. Once, at a bar in London, someone told me "Cheddar should be like a neighbour's party," which is a line I don't quite understand but have never forgotten. It is a totally appropriate way to describe the easy, unforgettable flavor of Montgomery's cheddar. The current wheel of English Farmhouse Cheddar has a really big cheddar tang with some nice brothy bass notes in balance with the bright, mineral, vegetal notes that are classic for this bold cheese. It was made in January 2018. "If I could come back as a mouse, I'd like to live in your place! That English Farmhouse Cheddar is the best I've ever had!"